I’ve never been fully content with how my résumé1 is formatted or presented. Normally I’d be fine with picking at it in Word or Google Docs since I only have to do this every few years, but since I have some free time and just re-did my personal site, I wondered: can I use my static site tool (Jekyll) to write my résumé in Markdown, and output both HTML (my preferred way share it) and PDF (what most recruiters want)? Keep it to one page, omitting any work experience over 5 years old. My first jobs as a barista and customer service rep aren’t relevant anymore! I used to have a skills/proficiencies section, but for the senior-level positions I’m seeking, those aren’t really relevant as my first contact with a company will not be my résumé. These days, job conversations tend start because of inbound conversations from former coworkers and friends who know I’ve been in the game a while. Even if that plugin worked, my site is running on Github pages, which has a strict whitelist of allowed Jekyll plugins, unsurprisingly not including anything related to PDF generation. The second point could be solved by running whatever build process I wanted locally and then pushing the static site up to my repo. 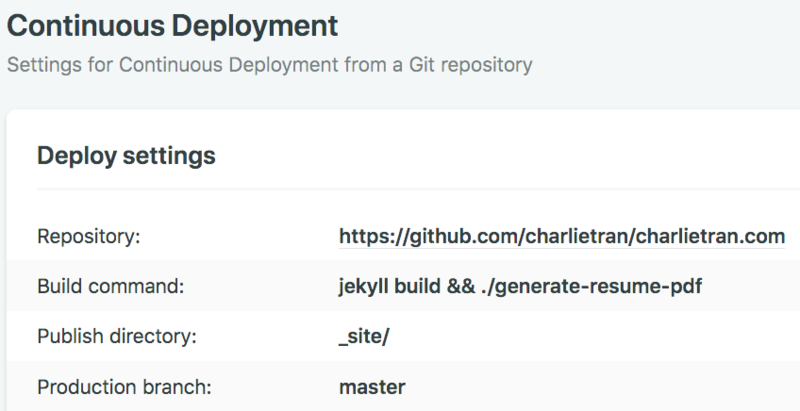 But I really like having git push as my deployment command, and also want to retain the ability to make quick changes to my site via the Github interface. Netlify has been praised by a few friends, but honestly I couldn’t understand what the fuss was about — it just seemed like a simple HTML hosting site. Then I understood that had the exact problem that their product is built to solve: I want to be able to push to my github repo, then have an arbitrary build command compile and deploy my static site. Switching from Github to Netlify took me about half an hour. I authorized my Github account and public repos, checked that my site was still generating okay on the default URL that Netlify gave me, switched my DNS A and CNAME records over and then I was up and running with a more powerful static site setup! As simple as the HTML page is, I needed the styling for the PDF to be much simpler! So I read up on print-specific CSS media queries, and used them to add some targeted styles that will only get triggered when a browser (or PDF generation tool) identifies its media type as print. Now I can edit my résumé markdown locally in Vim or in Github’s web-based code editor, commit, and within seconds Netlify will deploy both the HTML and PDF versions. Even with Netlify’s free account, the speed at which I see my changes go live is an order of magnitude faster than I did with Github pages. I think the results turned out pretty nice!